COX'S BAZAR, Bangladesh -- Nearly three weeks into a mass exodus of Rohingya Muslims fleeing violence in Myanmar, thousands were still flooding across the border Thursday in search of help and safety in teeming refugee settlements in Bangladesh. The crisis has drawn global condemnation, with U.N. officials demanding Myanmar halt what they described as a campaign of ethnic cleansing that has driven some 400,000 Rohingya to flee Rakhine state. One of the dozens of boats carrying Rohingya to the Bangladeshi border town of Teknaf capsized Thursday and at least two people drowned, police said. That brought known drownings in the Naf River to 88 since the crisis began. 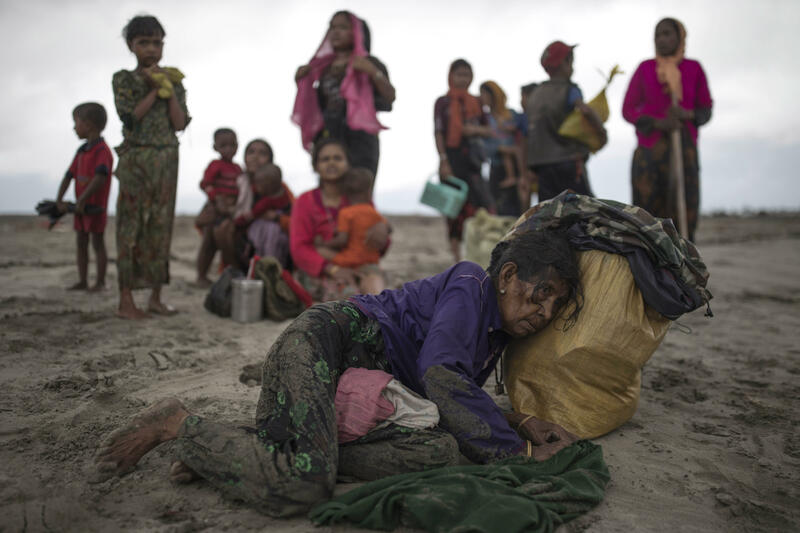 Those who arrived Wednesday in wooden boats on beaches near Shah Porir Dwip fishing village described ongoing violence in Buddhist-majority Myanmar, where smoke could be seen billowing from a burning village - suggesting more Rohingya homes had been set alight. One Rohingya man said his village of Rashidong had been attacked six days earlier by Myanmar soldiers and police. "When military and police surrounded our village and attacked us with rocket launchers to set fire, we got away from our village and fled away to any direction we could manage," Abdul Goffar said. Myanmar presidential office spokesman Zaw Htay said that out of 471 "Bengali" villages in three Rakhine townships, 176 were now completely empty while at least 34 more were partially abandoned. Many in Myanmar use that term as part of the long-standing refusal to accept Rohingya as citizens of the country. Myanmar has accused the Rohingya of burning their own homes and villages - a claim the U.N. human rights chief criticized as a "complete denial of reality." The crisis and refugee exodus began on Aug. 25, when Rohingya insurgents attacked police posts. Myanmar's military retaliated with "clearance operations" to root out the rebels, but the fleeing Rohingya say Myanmar soldiers shot indiscriminately, burned their homes and warned them to leave or die. Others have said they were attacked by Buddhist mobs. Hundreds have died, mostly Rohingya, and some of the refugees have needed treatment for bullet wounds. Facing growing condemnation globally, Myanmar leader Aung San Suu Kyi will not attend U.N. General Assembly meetings Sept. 19-25 to instead deal with what the government said were domestic security issues. U.N. Secretary-General Antonio Guterres told reporters Wednesday that ethnic cleansing was taking place against Rohingya in Rakhine state. The term "ethnic cleansing" is defined as an effort to rid an area of an unwanted ethnic group - by displacement, deportation or even killing. The U.N. Security Council called for "immediate steps to end the violence" and ensure civilian protections. Rohingya have faced decades of persecution in Myanmar, and are denied citizenship despite centuries-old roots in the Rakhine region. The thousands of Rohingya flooding into Bangladesh every day have arrived hungry and traumatized. Many need urgent medical care for violence-related injuries, severe infections or childbirth. "The women who are coming for check-ups all have a terrified and exhausted look," said Sumaya, a midwife at the Nayapara refugee camp working in association with the U.N. population fund. "We keep hearing stories from them of walking through jungles and across hills for days without food, their children carried over their shoulders. They've lost their homes." Two existing refugee camps were packed beyond capacity, and Bangladesh has said it would free land to build a third. Many of the new arrivals were huddling in makeshift shelters along roads or in open fields. Near the camp of Balukhali, some were setting up tents made of bamboo and plastic along hillsides muddy from days of rain. Children walked uphill to capture rainwater before it spilled into the teeming settlements below. Food, clean water and other necessities were scarce. Panic erupted Thursday along roadsides where local volunteers were distributing food, water and other supplies haphazardly from parked vehicles. Local officials shouted through bullhorns for volunteers to coordinate their efforts with aid agencies to avoid spreading chaos. "There are acute shortages of everything, most critically shelter, food and clean water," UNICEF country representative Edouard Beigbeder said. The U.N. children's agency said it needed $7.3 million to help just the hundreds of thousands of Rohingya children now at high risk of contracting water-borne diseases. On Thursday afternoon, a scuffle broke out at a makeshift relief center at Kutupalong, where some refugees tried to break into the center and were beaten back by at least four security guards wielding sticks. Those who managed to receive some aid after waiting hours in line were dismayed by the meager hand-out. "I have just got a tarpaulin sheet but no food," said 55-year-old Osman, who gave only one name. "I need rice to eat, I need to feed my family. They said they can't give us anything else. What will I eat now?" The head of the U.N. High Commission for Refugees said humanitarian assistance would increase "very, very quickly." Asked why the response has been slow, Filippo Grandi alluded to difficulties working in Bangladesh, but said he hoped this will change as the scale of the crisis becomes more apparent. It is the Myanmar government's "responsibility to ensure that security returns to Rakhine," Grandi told The Associated Press at the Stockholm Security Conference in Sweden. Bangladesh already was housing some 500,000 Rohingya who fled earlier flashes of violence including anti-Muslim riots in 2012. Rakhine state had up to 1 million Rohingya before the latest violence.